The following pictures were rescued by Roger Worster, when one of the Howard’s Dairy sites was being demolished. We believe these photos were originally taken for publicity purposes and therefore taken in and around the local area, but are wonderful pictures capturing a time gone by. 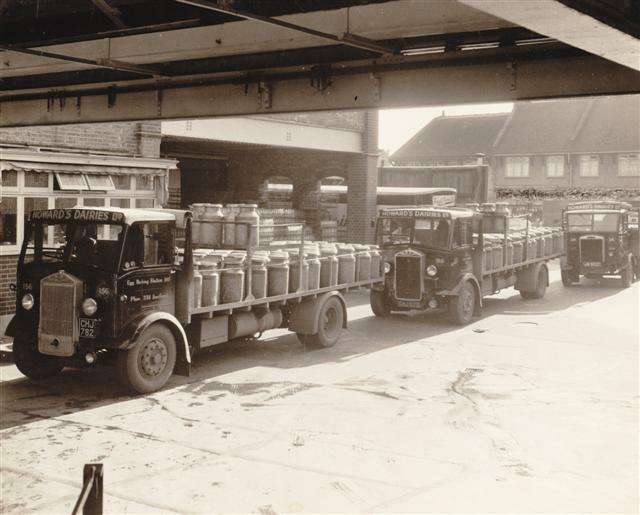 The first photo shows a lorry collecting milk churns, possibly from one of the farms in Benfleet which supplied the dairy. From farm to dairy for bottling. Head 'em up and move 'em out. These next 2 photos show the old horse and cart wagons leaving the dairy and out on the road delivering. Moving into more modern times we now see the electric milk float taking over from horse power. The milkman appears to be very customer friendly in this shot. Remember those days of being the milk monitor, and drinking those bottles of warm milk in mid summer with the thick layer of full fat cream on top? Could this be the first lorry with cooling facilities? 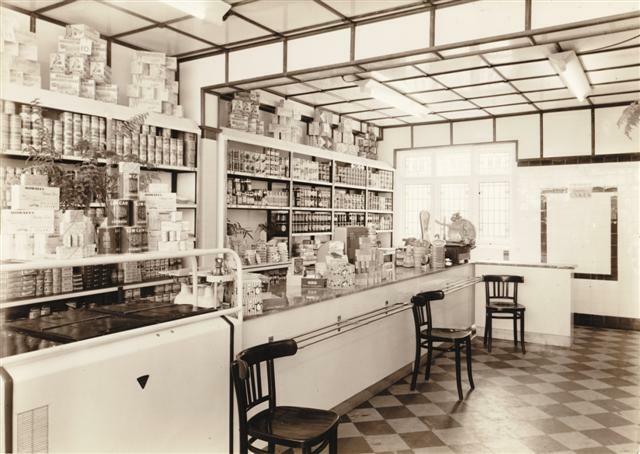 This photo shows one of the Howard's Dairy shops. Not much like today's supermarkets. Here you can sit down and pass the time of day with the staff. My grandad was Alf Pepper his horse was Don. They retired from Howard’s Dairies in 1961. My mum said he was the last milkman with his horse in Southend area. I have a newspaper article and photo. Number 92 was written on my grandad’s cart with his horse back in 1961, does anyone know the meaning of the number? I was the stable boy back in the 60s getting a horse ready for the milkman in the mornings. I still remember having to keep the stallions separate. Also, my dad used to work there, after 40 years he retired, great days. The bottled milk on the truck is Sterilized milk and therefore needs no refrigeration. The shape of the bottles and the ‘crown caps’ make it recognisable. The box trailer would be an insulated trailer which contained refrigeration but needed an external power source not available in those days on the tractor. 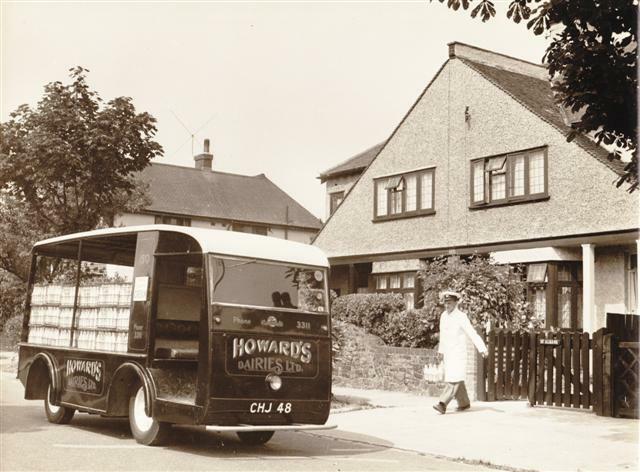 My father was chief engineer at Howard’s dairies from 1944-1981 and was based at 1261 London Rd which was their main bottling depot in Leigh-on-sea. We lived in St Clements Avenue in Howard’s dairies house right next to the bottling plant and so I have many memories of the company. I also have some photographs of the company and it’s activities. The first post about my Great Great Grandfather, James Broomfield, owning a dairy on Broadway, Leigh on Sea is documented in Kelly’s Directory 1902. Previous to that he had been a dairyman in London (Lambeth area). Anyone have any more information on early dairies in Leigh? My Great Grandfather, James Broomfield, apparently owned a dairy on Broadway, Leigh on Sea. Does anyone know anything about it? My notes say, ” When he came back from New Zealand, he bought the dairy in Leigh-on-Sea. James ran the dairy for many years until he sold it to a man, last name of Howard. Howard eventually merged with another dairy and called themselves ” United Dairies.” Does anyone know this part of the dairy history in Leigh? Sorry this is long but I hope informative. Some information was taken from some writing I asked my father to do quite a long time ago when I was researching the family history. My great grandfather was F.W. Clement who owned Clement dairy. The brothers , Arthur, Frederick ( my grandfather) his twin called Ernest, bought Clement dairy off their father. Ernest sold his part at some point and left the company, later wanted to come back to the firm which was refused. Ernest had several businesses and made fantastic ice cream and pies according to my mother although never came back into the family business. My grandmother, went to work for Clement dairy ( later marring Frederick Clement ) as their book keeper. At that time , Milk was 1 3/4 a pint and they had 9 rounds and every customer had a hand written bill every Friday. They worked with estate agents to get the names and addresses of people buying new houses and paid them 7 shillings and 6 pence for a three pint a day customer and 2 shillings and 6 pence for a 1 pint a day customer. Small parcels containing butter, cream, and an egg in a nice box with Clement dairy were used as a goodwill gift to new customers. Before long they had 18 rounds. They were going to build a bottling plant at 1261 London road and that triggered the amalgamation with Howard’s dairy and the Clement name disappeared. A water diviner had told them there was water on the site of the bottling plant and they had expected to find it at 400ft an agonising time ensued and they finally hit water at 800ft. My grandfather Frederick went to war as a dispatch rider and was stationed in France for 5 years in Belgium and France while his brother Arthur continued in the milk business F.W.Clement in the Broadway Leigh-on-Sea Essex until it amalgamated as Howard’s dairy with H.G. Howard as chairman . My grandfather, (Frederick ) and Arthur as joint managing directors and Alec Steel as non executive director. At that time there were around 50 welsh cob horses pulling milk floats as well as a number of hand carts. My grand father used to go to Lampeter, west Wales to the annual horse fair to buy the Cob horses for the business. My father (another Arthur) and his brother John Clement both came into the business of Howard’s dairy I am not sure what year and sadly both have now passed away. My father left Howard’s dairy and John stayed on. Just for info; Unigate traced its history to 1885, when (according to legend) Guildford grocers Charles and Leonard Gates were seized by pro-temperance sentiment, poured away their stock of wines and spirits and converted their yard into a dairy. Their business flourished in succeeding generations and expanded into baby foods under the brand-name Cow & Gate. In 1959 it merged with United Dairies to form Unigate. 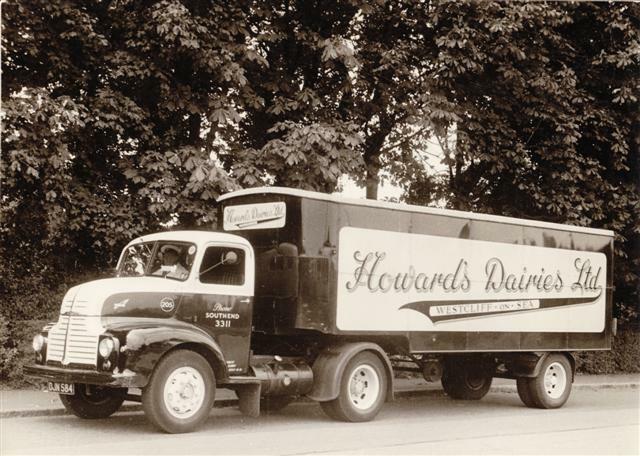 Who would have thought Howard’s would become part of a huge history of the milk business. I hope I have managed to fill in some of the gaps. Or maybe you already knew. Lovely to see these pictures. My Father was Arthur Clement, whose Family were Clement Dairy many moons ago. 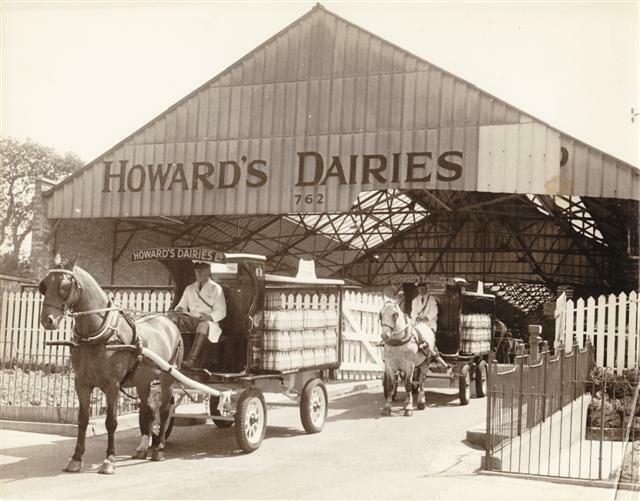 Howard’s dairy is very much part of our family history too. My Grandfather Frank White worked for Howard’s Dairies in Benfleet. Happy days. He drove a horse and cart as I remember. Loved my summers in South Benfleet. School closed in Scotland in June so we stayed with my Grandparents in Fleet Road for the 2 months school holidays. I also worked at the sterilised milk depot at Hadleigh, for a short time. I remember Brian Baker his dad, Freddie Fern Percy Lamb, Dougie Berrington, Tom Ward, Bill Brown, Brian Pilsworth, and Ken Bryant to name a few. When the milk came out of the ovens it was stacked on the bank to be loaded when cooled. That was called the hot bank. Nice in the winter and very hot in the summer. My Dad Laurie Shipway worked for Howards Dairies for a number of years mostly in the boiler house. Good memories. Julie, you said your grandad was the last milkman in Westcliff to deliver by horse and cart. Was his name Andy? We had horse and cart delivery into the late 50s possibly early 60s. The horse was called Katy. I worked as a milkboy for Howards at Shotgate from 1964/68. The two milkmen were John, and the superviser was Terry Hare, a great guy. Their depot was in Rayleigh. The people of Shotgate were very generous. Great times. My Dad, George Elford drove the Dennis HGV lorries through the 60’s based at the Southchurch depot. My Grandad, Philip Williams drove a horse drawn float up until they stopped and then worked in the bottling plant. 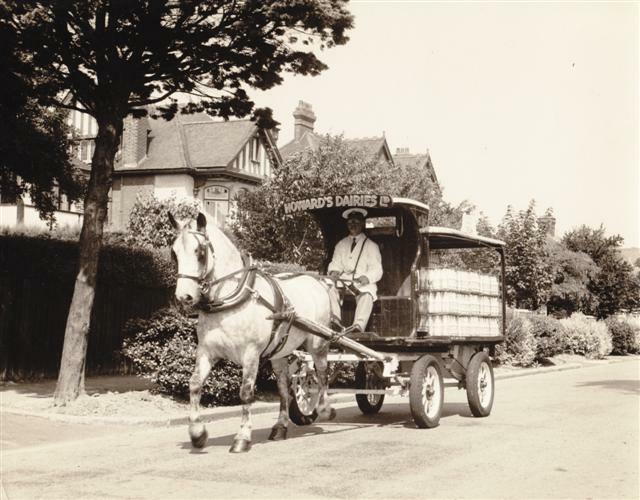 My grandad was the last horse and cart milkman in Westcliff-on-Sea, Essex . Worked for Howards based in Rayleigh. Had a round in Wickford serving London Road and Nevendon Road. Wonderful Customers. Wickford was just developing then. Milk was priced at five old pennies a pint. Around two and a half pence in todays money. I delivered around 800 pints per day then, more on a Sunday. Mr John Clement was a director at the time. My memories of Howards Dairies go back to about 1962. My Bungalow backed onto the fields owned then by Howards Dairies and we took great delight at watching their cows and calves feeding in these fields. In the hot weather I used to take up a bucket of water to them when they were standing under the large Oak tree whose branches spread out into the field. Sadly Howards Dairies are no longer at Jotmans Farm, which is now predominately for Horses. This land unfortunately is now being earmarked for development, as if we need to make Benfleet and surrounding areas more congested. I worked at Howards Dairies at Oak Road, Hadleigh in the Dairy and driving the lorries. We started the bottling plant at 700 am every morning bottling “sterilized” milk as the milk tanker from Norfolk had to be pumped out and on his way home. The bungalows on the right of the road housed workers from various departments. Ron Calthorp was my boss and Ken Bryant ran the milk cleansing plant in the Dairy. Howards will always have a place in my heart as I met my wife there and both of my children were born whilst I worked there also. Very happy memories of days gone. My father worked at Howard’s dairy in the late 50’s and early 60’s and we lived in Oak Road number 12 it was a Howard’s dairy house. I was as wondering if anyone has any photos of the houses from that time. Thanks Sue. 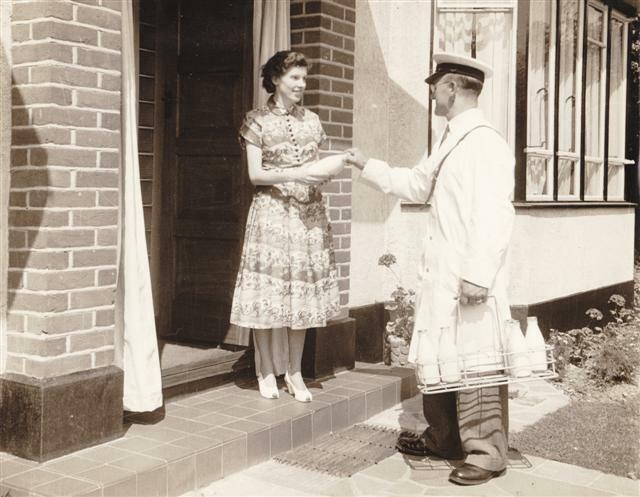 I helped our Howards milkman back in the early 50s. I used to meet him at 6am on Saturdays + Sundays at the bottom of Glenmere Park Ave on Kiln Road. I worked until Midday or later, depending on weather, and he would give me 2 shillings (or 10p depending on your age). Also the school milk was stopped by Mrs Thatcher saying it was not needed by children any more, in fact cost saving for HMG. I am researching a First World War connection to ThorpeBay, involving Red Cross / VAD facilities along Eastern Esplanade. Enquiries have indicated that the property situated at 202 (now a Chinese Resturant) may have been called ‘The Glen’ aka ‘Glen Holiday Home’. However, other information suggests that the same premises was used by Howards Dairies about the same time – so I would like to try and clarify the situation if possible. Click here to view a photo associated with this comment. 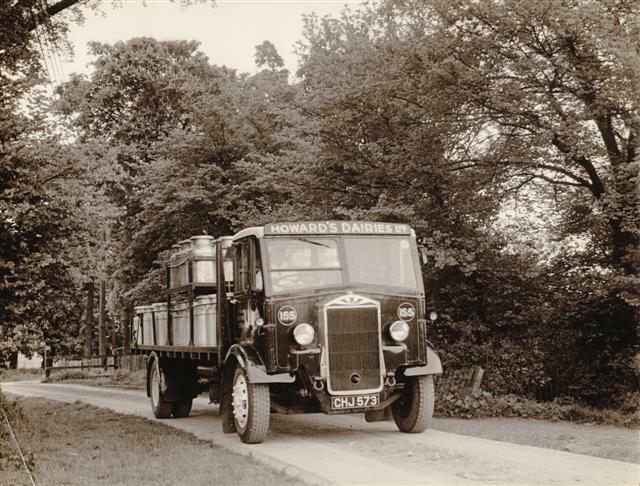 Lots of nostalgia with these photos of Howards Dairies lorries in all their splendour ! 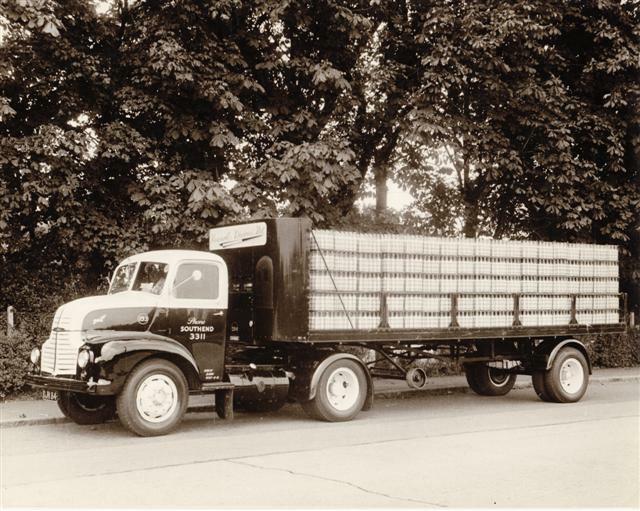 My father and I were HGV drivers for Howards during the 1960s at Oak Rd, Hadleigh. The churn lorries waiting to unload were at the dairy London rd, Leigh.The livery was dark blue with yellow roof and wheels very smart. In about 1958 as a child of about 11/12 years Myself, my Brother Graham Reed (RIP) and our friend Roy Hutchins, all of mid Thundersley Park Road, used to help our local milkman (John, I think) in his Milk Float on the top and most difficult part of his round. This was done as often as we were available, because we received a bottle of very sweet sickly orange juice in payment. We often had to help push him out of the mud and puddles in the very many unmade roads of the time. 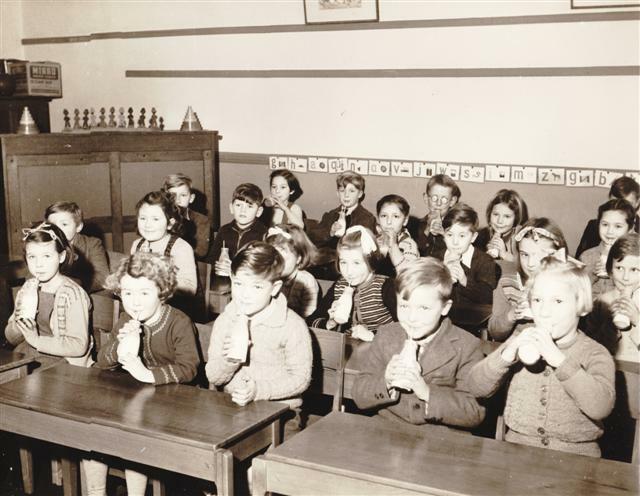 The picture of the children drinking the milk does bring back a lot of memories, but I think they were actually 1/3 pint and never 1/2 pint bottles. Special production for schools and never retailed.